IWCO Direct’s Client Services team has been working diligently to ensure we provide the best possible experience for our customers. One way we’re doing that is by applying Continuous Improvement methodology to the hand-offs that occur at the start of each new job. 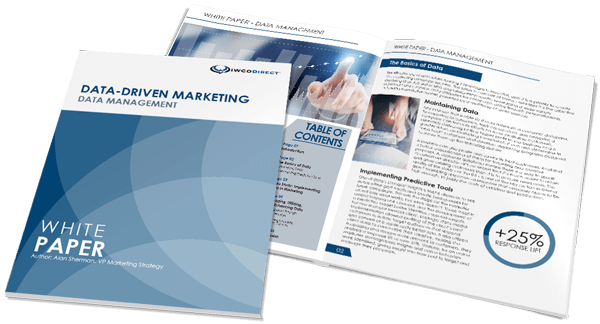 Marketing programs are becoming increasingly more complex with the implementation of digital presses, more targeted marketing and sophisticated data use. The more details and conditions that a campaign has, the more crucial it is that communication is on point and the front-end hand-off process is as streamlined and efficient as possible. The front-end hand-off process moves artwork, data and instructions through the creation process so our content development team can layout the format of the piece and program the data correctly. If this process doesn’t go smoothly, it increases the risk for error and can create rework, which leads to longer lead times. Keep finding ways to improve process management. Number three is crucial. We’re constantly looking at ways to improve our front-end hand-off process through our Continuous Improvement efforts and implementation of new technology. We’ve been utilizing our Continuous Improvement team to facilitate projects across Planning, Content Development, Account Management and other departments to standardize elements like initial job instructions and mock-up processes. One of our biggest projects has been the development and implementation of the business process management tool. This tool acts as a single source for all of our best practices and processes and helps us streamline alignment between resources. It also allows us to better train new employees and acts as a reference for others. Another benefit this tool offers is putting communication in “like-terms” to ensure everyone is on the same page and all critical instructions are communicated and on the record. It creates a consistent knowledge of programs, delivers complete information, ensures the timeliness of information, and helps our counterparts downstream complete their portions of the project on time. Other ways we are working to improve and streamline our front-end hand-off process are to increase collaboration across departments, standardize processes and roll out new processes across our entire platform. We are also focused on better outlining how to input new information and continuing to evolve the onboarding process. In the end, one of our main goals is to meet mail dates and produce a high quality product—streamlining hand-offs lets us do both, laying a foundation for success. If you have questions about our front-end hand-off process and other Continuous Improvement initiatives to deliver an exceptional customer experience, contact me today.